Up, down. Up, Down. Up and down again. This is all too familiar for me and every camper I know that is in charge of hooking up the truck and trailer. First, up to get above the truck ball, then down. Sway bar hookup. Then back up to set them, then back down. It is easy to use as you don’t need to be strong or have equipment, which are two must-have requirements while using a manual jack. If you don’t want to break a sweat before going on every weekend camping trip, and an easier time getting the trailer level when you get there, then read on. It requires very less efforts from your side as compared to a manual jack. It is the safest option if you are suffering any physiological issue like back pain or knee pain. All electric jacks have an error-proof design, so once you put it in a position, it will hold against it as desired. Some jacks also come with remote control. You don’t require to do any work at all. If the batteries are low, you can still use it as a manual crank jack. Electric jacks are more expensive than manual jacks, but they are worth it since you don’t have to do any heavy lifting. To know the trailer tongue height, you will have to measure it. Park the RV or trailer on a leveled ground and measure the distance between the ground and the coupler bottom. It is important to check because the jack only rises four inches above the coupler height. If the difference is more, you won’t be able to tow it. Check the jack’s height in both, retracted and extended positions. Measure from the bottom to the location where it gets mounted. Usually, all popular electric jacks available in the market fit the regular A-frame trailer. Check twice before you make the purchase. An ideal electric jack should bear anywhere between 3,000 to 4,000 pounds of weight, which is around 15 percent of your RV weight or less. Electric jacks are available in two shapes — straight tongue and A-frame. The one who chooses depends on your RV’s metal frame. If it is A-frame, then purchase an A-frame jack. Some brands also have products that work for all frame times, which makes them a more durable option. Before you hook the RV, ensure that you have the right ball size. It is usually mentioned on the coupler. Take another person’s help or keep a camera handy to guide you while hitch the trailer to the vehicle. Disconnect utilities and raise the stabilizers. Chock the rig. It isn’t always necessary, but it is a good practice. Close the locking lever, secure it with a lock, pin, or anything else so that the jack doesn’t come undone. Connect all the utilities and make sure all of them are working properly. Take time to check every one of them. Some brands offer special instructions for their electric jacks, so go through them thoroughly. Check if the headlights are working properly. Remove the chocks and ensure that the TV or radio antenna is back in their positions. Adjust the mirrors according to your comfort and take a test drive to ensure the jack is locked securely. 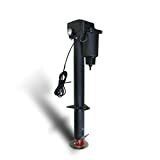 Available in black and white, RAM Trailer Products EJ-3520-BBX Electric Trailer Jack with Drop Leg is easy to assemble, install, and use. It comes with an additional drop leg of 7 ½” just in case you need it. The gears are constructed using durable hardened steel, which not only imparts its strength but also protects from moisture and rust. The jack has a weight bearing capacity of 3,500 lbs, which makes it a great choice for small RVs or motorhomes. Ensure that you don’t exceed the limit as it will cause the jack to break. The jack’s battery works on a 12 volt operation. Its inner tube has a zine finish, which protects it from rust and water damage. Also, the product comes with LED lights on all four sides to make working in the dark absolutely easy. It comes with a manual crank handle, which you can use to manually fit the jack in case the battery is low or dies down. You will receive a one year warranty on the product’s workmanship and defects. 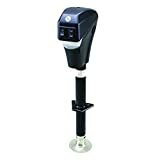 With a superior lift range of 9″ to 31 ½”, Uriah Products UC500010 Electric Trailer Jack is one of the best ones available in the market. It has a travel height of 18”, which is perfect for all sizes of RVs. The jack is only available in black color and weighs 22.3 lbs. It can bear up to 5,000 lbs of weight. Its easy to use mechanism helps in lifting and lowering your motorhome without any trouble. It has a water-resistant motor housed in a one-piece plastic that add extra protection from moisture, heat, and dust. The jack’s ball screw design and brake motor improves lift efficiency and decreases friction. These two features prolong its life since you need to exert minimal pressure to achieve better results. The plug-in 7-way connector has a plastic cover to protect it from the weather and dust. It comes with a one year warranty against defects and parts. 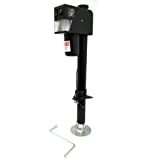 Another electric jacks that uses 12 volts of power, A-Frame RV Trailer Jack has a maximum tongue weight bearing capacity of 3,500 lbs. You get a removable foot pad in the package that you can use while leveling the RV. When you aren’t use it, shore the pad in a dry and dark place. Both, the inner and outer tubes are coated with a zinc finish to resist moisture, dust, rust, and corrosion. It has a three-bolt mounting and fits perfectly into a standard A-frame trailer coupler. You also get a separate manual crank that you can attack to the jack instead the battery is low to turn it into a manual jack. It fits perfectly into a 2 and 2 ¼” standard trailer tongue mounting holes. It comes with a one year warranty on workmanship and defect. The Brute HB4500 power jack stands true to its name. It is strong and durable and doesn’t require any efforts to lift your RV’s tongue. It has a 6” adjustable drop down leg that helps you to level your RV on a variety of uneven terrains. The main tube is 2 ¼” in diameter, so it will fit any standard trailer tongue mounting hole. With a weight bearing capacity of 4,500 lbs, you can be assured that the jack will last you for an extremely long time. It has a quick travel time of 10” in just 38 seconds. It extends up to 18” in total length. Husky Brute has a special ball screw design to increase lift efficiency, which helps to prolong product and motor life. Even though it comes with a one year warranty like all other products, the customer service offered by them is the best. A brilliantly-designed product, the Lippert Power Tongue Jack has four LED lights that throw lights on all sides to ensure you have no difficult while working in the dark. All you have to is the place the jack and hit switch-on to get the work done. If the battery is low, you can turn it into a manual jack by connecting the handle crank. It has a weight bearing capacity of 3,500 lbs, which means you can only use it on a small-sized RV home. The jack only uses 30 AMP and has a travel stroke of 18”. Encased in a textured casing, it is easy to handle and protects the motor from cracks and chips. The total bracket height is 10 ¾” when retracted and 28 ¾” when expanded, so you have enough to use for a variety of RV and trailer sizes. Other than that, you receive a one year manufacturer’s warranty. Here is a detailed walk through on How to Install a New Electric Jack on your Trailer. After carefully considering all five jacks, we went with this Powered Trailer Jack. It is mostly because of the weight bearing capacity of 5,000 lbs and our Toy Hauler is heavy. With extra capacity, we always like to error on the safer side. Also, we liked its three-bolt mounting design and the inner tube has a zinc coating that protects the motor and insides from water damage and therefore, prolongs its life. We definitely recommend this jack for your RV too!